Want to Listen to Music with Friends in Peace? Try this Brand New App! Music is one of the few things that has been enjoyed in groups since, well forever! Even today, people listen to music socially in dances, concerts and parties, among other places. In today’s day and age everyone can stream music to their tablet, laptop, or phone through headphones at the touch of a button, listening to music is becoming an increasingly personal experience. Trying to bring back the trend of listening to music casually with friends, Find What You Like has launched its brand new app called the Listen Together App, that will, according to the website itself, “Keep everyone at the party happy with the music.” Featuring a “voting” system that will allow users to elect their favourite track, the app will surely keep everyone enjoying their favourite tunes. The app comes in collaboration with all major music streaming services like Deezer, Spotify, SoundCloud and YouTube, which makes it all the easier and interesting for the listener to make a customised playlist that features all your favourite tracks. The basic idea behind the “Listen Together App” is to allow the users to actually engage and be more interactive in the process of discovering and listening to music. That said, it is equally useful at social occasions such as parties! 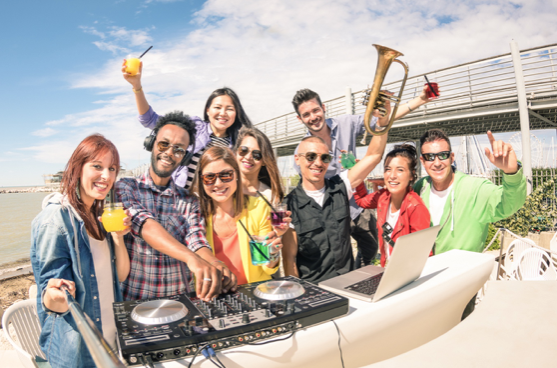 If you’ve ever dreamed of becoming a popular DJ, perhaps this is your golden opportunity, since the app allows everyone in the group to be a DJ! Thanks to its voting system, which is automatically enabled in every room, users can vote and add songs whenever and wherever they like. The song that gathers the most number of votes gets played next. With music streaming services such as Spotify and Deezer integrated into the app, Listen Together will import songs to your own library automatically, allowing you to have your favourite tracks ready to listen to with your friends. The app also features an integrated search option, that allows for much easier navigation to find the track that you want to play next. An ideal thing for get-togethers and parties, the Listen Together App allows you to listen to songs happily without any arguments on “which track should play next,” since the “voting” system allows everyone to have a say on which track should be played. This will help you create a party playlist on the fly, which will stop your guests from getting unhappy with the music being played. Furthermore, it will also add to the fun of the party, given that “Everyone can be the DJ!”. Since the app is live, you can try it here. Currently available exclusively through a web browser, Listen Together will soon be launched on Play Store and iOS App Store. You can access all major music streaming providers through the app, from Spotify and YouTube to Deezer, and Soundcloud!